When you think of perfect meal, do you think what type of cookware should be used to make it? No you don’t. You are usually giving credit to chefs. But Chef’s secret today is not some mysterious spice, but his/hers cookware – like All Clad d5 Cookware. Cookware can change the way your food tastes, and how fast is it prepared – resulting in different quality of meal. Stainless steel 18/10 or better sometimes, has become a must for every professional. This cookware will not alter how your food tastes and you can be sure it will have the same taste every time you cook the same meal. What does this 18/10 mean? 18 is actually a percentage of chrome and chrome is necessary to make the steel stainless. Although in perfect conditions 13% of chrome would be enough, 18 is a standard today because steel and chrome will not be evenly distributed, so its a “just in case” method to make sure whole product will be stainless. 10 percent is nickel (yeah like the 5 cent coin), because chrome makes the steel hard to shape in a process called deep-drawing. Nickel will soften the steel so it can be easily formed into pots and pans. All Clad d5 – the future of cookware? If you already own an all clad cookware set, you know the value of all clad pots and pans. But should you replace it with new d5 set? Its a tough question if you are using it only for home cooking, since it will depend a lot on your budget. But even then you should try and find all clad cookware sale and get your hands on some of these pieces. I was talking to one of such people, and he (yea men cook at home too) told me that he enjoyed a d5 cookware, and can vouch that All Clad d5 skillet was much better than the old one from same brand. You can see the review in this video. But what are technical details that are different from regular all clad cookware. First off, number of layers in old pots and pans is 3, and d5 cookware has 5. This also makes if heavier than old cookware. Cooking surface is the same 18/10 stainless steel, then comes aluminium layer, then another stainless steel layer, then aluminium layer, and finally – the outer surface if the same good old 18/10 stainless steel. So 2 aluminium and 3 stainless steel layers alternate. Aluminium is used to make the heat distribute even across the cooking surface, even though you might be using a big pan on small fire. This new d5 cookware can also be used to cook on induction cook tops as the old one. Some details like ergonomic handles and some other improvements has been done to ensure it is actually more attractive to buyers and really show off with some details. I personally love that rims are made in a way that pouring over them will not cause a mess like the old all clad cookware could sometimes. 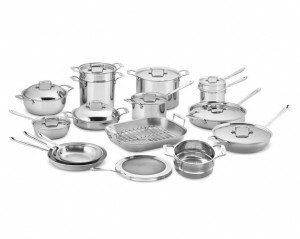 All Clad d5 cookware cost is about 10-20% more, depending where you get it from. I would buy a whole set if i already didn’t have an old one. If you don’t own a decent cookware set, these pots will not only do fine, but you will feel like buying a Mercedes or BMW in kitchen terms. This is really the final solution as far as I’m concerned. If you don’t have money for the whole set, just buy the one pot and one pan you use most often, and you will find yourself saving a money for the whole new all clad d5 cookware in no time. This entry was posted in All Clad Outlet, cookware reviews, cookware sets, induction cookware, pots and pans set and tagged All Clad outlet, cookware reviews, cookware sets, induction cookware, pots and pans set. Bookmark the permalink.